Junk Chic Cottage: Lets Get This Party Started!! I had my annual Girlfriend Charity Christmas Party last night and here are some pictures and a fun surprise to share with you. Let me start by saying I have the greatest group of bff's ever. 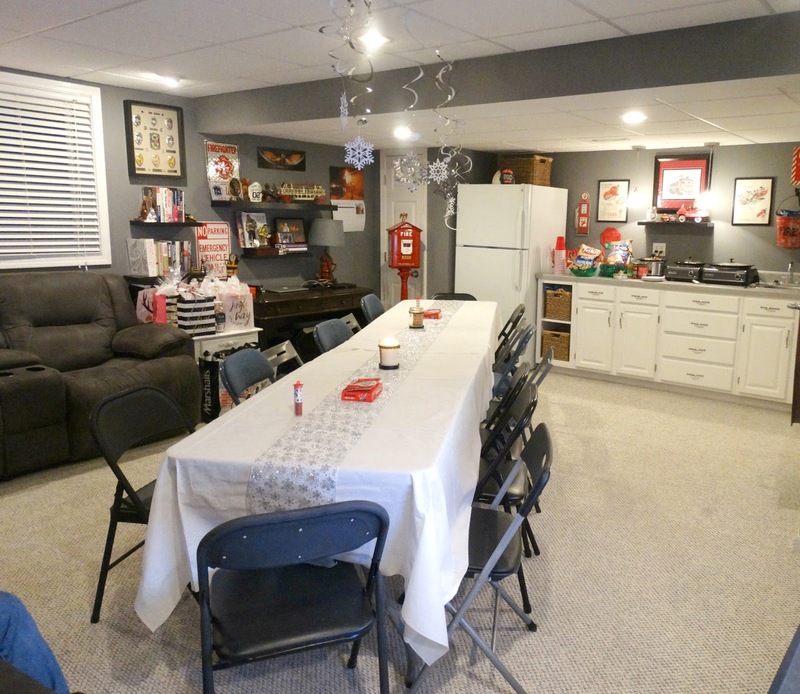 I host this party each year to celebrate our love and friendship. My daughters now as young adult women are part of the party and invite their special bff's to come. It is fun that they want to be part of this wonderful tradition. Now on to my surprise. Not sure about you guys but I hate being surprised. I just have never liked it. My hubby Terry knows better usually not to surprise me with anything. Nope just do not like it. Well that Man pulled off a good one last night! I know a lot of you know Diana from Nana Diana Takes A Break Blog. I have known Diana for the past few years and we have become very good friends. Diana lives about 4 hours north of where I live in the Chicago burbs. Diana has a beautiful home in Green Bay Wisconsin. We are always saying let's find a half way point and a day to meet up. Like with most well intentioned plans we never seemed to come up with a day for a meet up. That all got remedied with Terry surprising me and having Diana come in for the party. Here we are meeting in my living room Friday night. I was so surprised when Diana walked in the door. We had such a great time together at the party. We felt like we have known each other all our lives. She fit right in with my crazy bunch of friends and everyone said they all felt Diana had been in our circle of friendship for a long time. 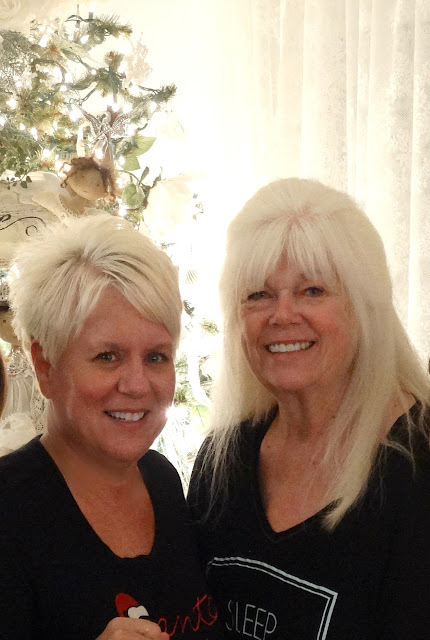 Thank you sweet Diana for coming in for the party and spending some time with me this weekend. Here are some highlights of the party. I promise I will not bore you with a lot of pictures. The house was all a glow for the party. 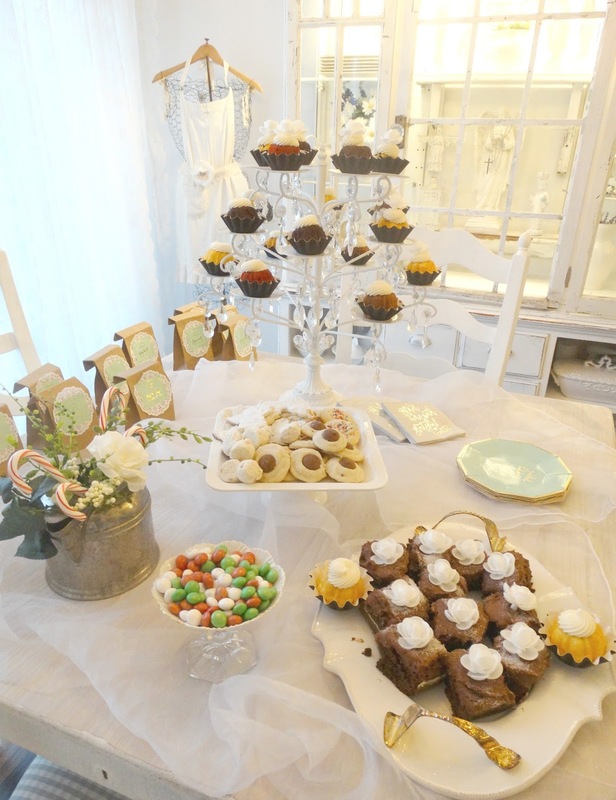 The sweets table was ready for later in the evening. Terry's "Fireman" Cave converted to a "Chic" Cave for the night. A long table so we girls could all sit together to eat, drink and play games. 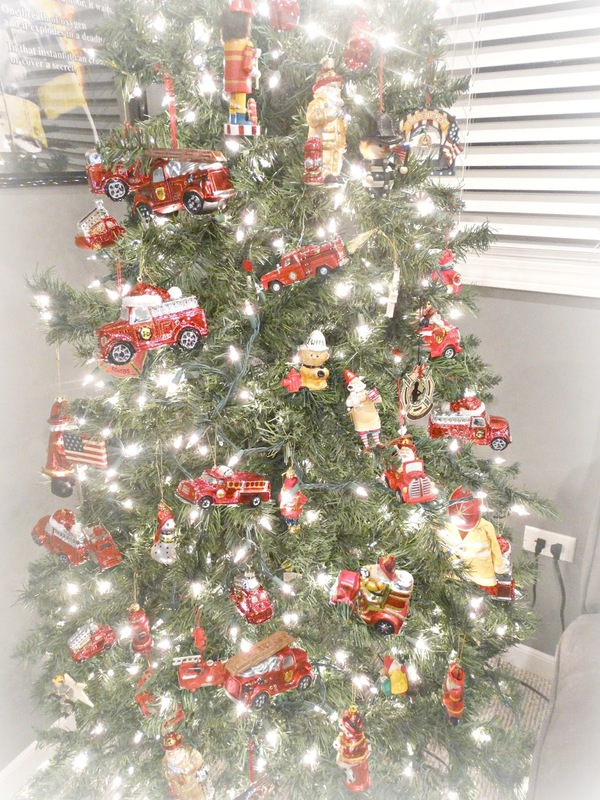 Terry's fireman Christmas tree was glowing with all his collected fire department ornaments. Walking Taco Bar ready to go. 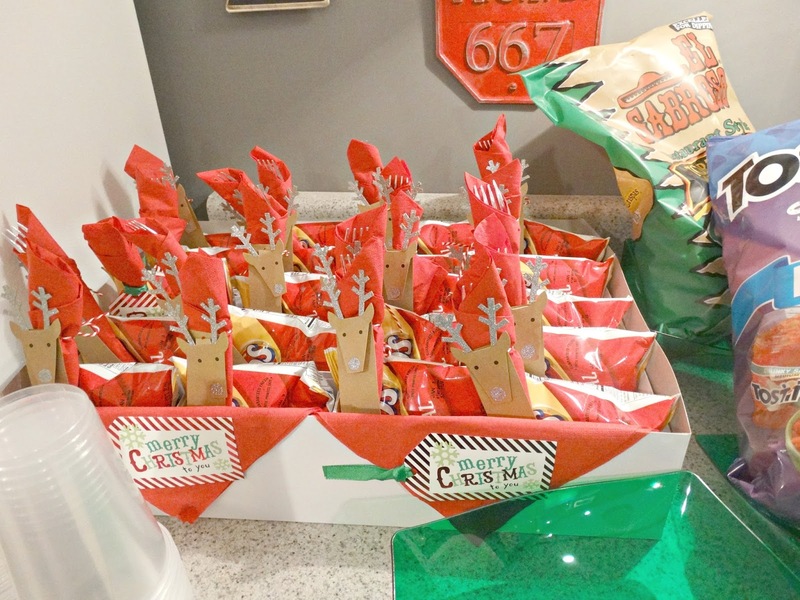 Remember those cute little reindeer/Frito bowls I made for the walking Tacos. Ready to be filled with yummy taco meats and toppings. Prizes for the games we played. Here is a group pic. We were missing a few girls that had to leave early before we got the group picture taken. Even though we told Cooper no boys allowed he wanted to be part of the girlfriend group shot! We had lots of fun eating and playing games and of course the gift exchange. 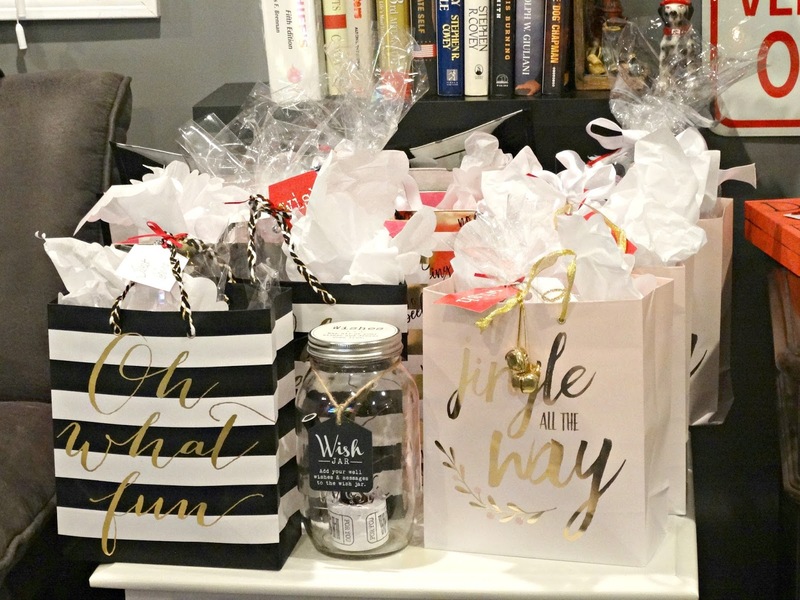 Each girl brings a gift that some or most of the proceeds for buying the gift benefits a charity. It always amazes me each year the beautiful gifts the girls bring for the exchange and how beautiful these gifts are to share. It fills our hearts to know we have received a beautiful gift to take home that also is benefiting someone else in need. 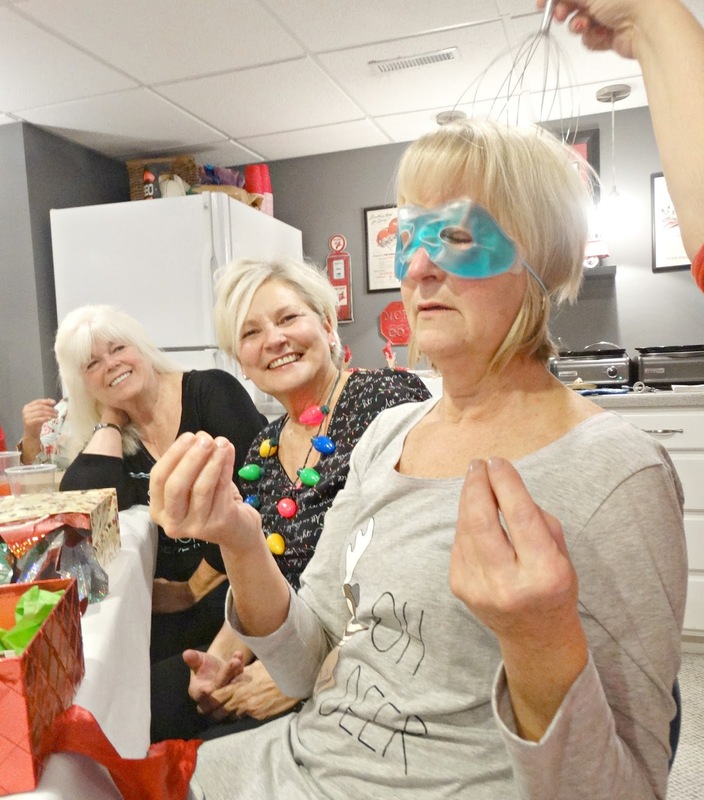 This is my fun friend Pat trying out her spa gift! Pat was feeling her Zen with her new spa items. These are the two brave bouncers for the party. We tired Cooper out with all our laughing and fun. This is why we told him no boys allowed they cannot keep up with us party girls! Hope you all are having a great weekend preparing for Christmas. This party always kicks off the season for me. 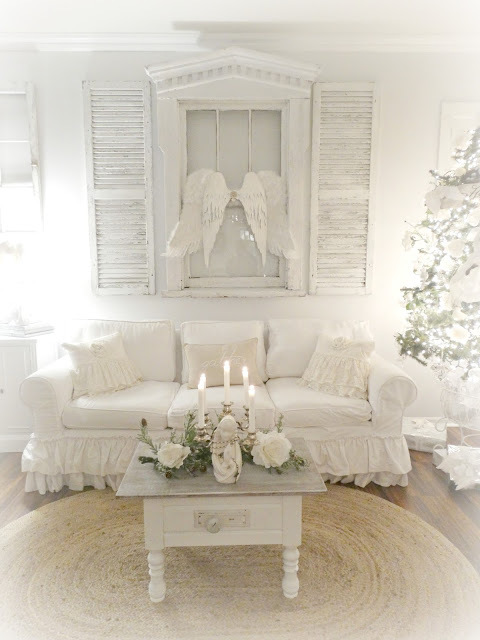 Stay tuned this week I will have my Holiday Home Decor to show you. Have fun decorating and getting ready for the big day. Glad all my decorating is done. It just makes this fast moving time of year more enjoyable. It looks like a wonderful time and everything is so beautiful. Terry's fireman tree is just wonderful! Oh what a fabulous surprise and the party looks like such fun. Everything is decorated so beautifully. What a wonderful gift of a visit from a cherished friend to make your night extra special! Your hubby gets an A plus! 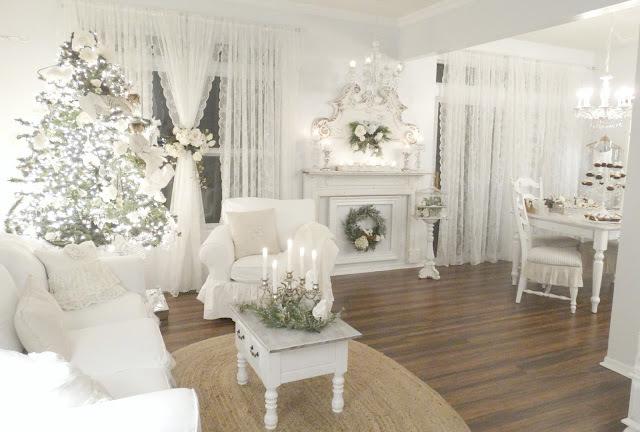 Your home looks like a winter wonderland and your friends and family are lucky to have a friend like you, Kris. I can tell by the smiles how much fun everybody had! Oh what fun, and you all had so much fun. I really miss this kind of a get together. My girl friends on Long Island New York do this and I'm so jealous I can't always be there. Your house and decorations are over the top as i would expect from you. So glad you had a surprise guest also. LOL! I HATE having my picture taken!!! But you know that and so do you- another thing we have in common. Kris, I had SO much fun! I am going to steal/borrow/take (pick one) a few of your pictures here for my own blog if that's okay. I was so excited I never took my camera out. LOL tooo funny. I just peed a little in my pants about your motel pick up!!!! Oh girl you are too funny. Hey you got Ubered, picked up in a night gown and a swanky breakfast the next day. Life is good!!!! Hugs and thanks for coming and making this night so special. We had sooooo much fun and you were the icing on the cake!!!! or should I say bundt lol!!!! PS. I take the worse pictures too. So thanks for being a trooper and letting us get photographed together. I wish all these bloggers could see that we both don't look a day over 25 in real life LOL!!!!! Well, I'm going to geek out a little here (ok, a lot) and tell you how excited I was to read this! You and Diana in jammies at your party was a wonderful moment for me this morning. LOL I am beyond thrilled that you two nuts finally got to meet and hug and act up together! I'm completely jealous but so, so happy that Diana was able to surprise you on party night. That photo of you two is priceless and shows exactly why I love you both- warm, authentic and a little bit crazy. My kind of women! What a great night for all of you. Kudos to Terry and the girls for delivering your special guest. What an amazing surprise!! I know how close you girls have been and this was a really awesome way to meet!! Diana is the road trip queen, I can totally picture her saying sure! Why not! AND...I can only imagine the laughs you shared! What a great way to top off the excitement of the evening. Now on to the house...unbelievable. Your home is always lovely, but under the light of Christmas, it's ethereal. I could stare at it all day...never, ever bored with your pictures! Glad the night was a huge success! What a special event, Kris! I just read Diana's comments too....hilarious! I'm so happy you had a great time and turnout. Cooper...lol. 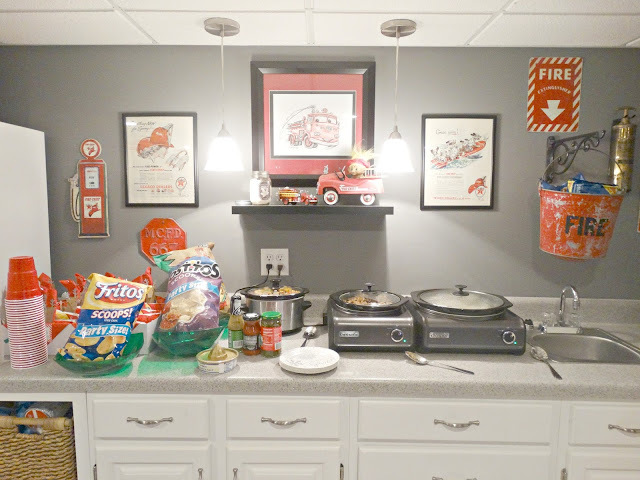 Your home looks great, and Terry's mancave is a perfect party station!! Whew, I bet you're tired today...relax and pat yourself on the back for such a memorable event. The fact that your girls want to come and bring their friends speaks volumes. Love that. What fun! Plus I never fail to admire your decor. So peaceful, tasteful and gorgeous. Sending holiday greetings to all. It looks like a fun evening! And Cooper is SOOO handsome!! What a wonderful party and a great surprise! Diana and I are from the same area of Florida, so I feel I know her too! What a fantastic party, Kris! How wonderful that Diana was able to come too. Sounds like everyone had a fun time. 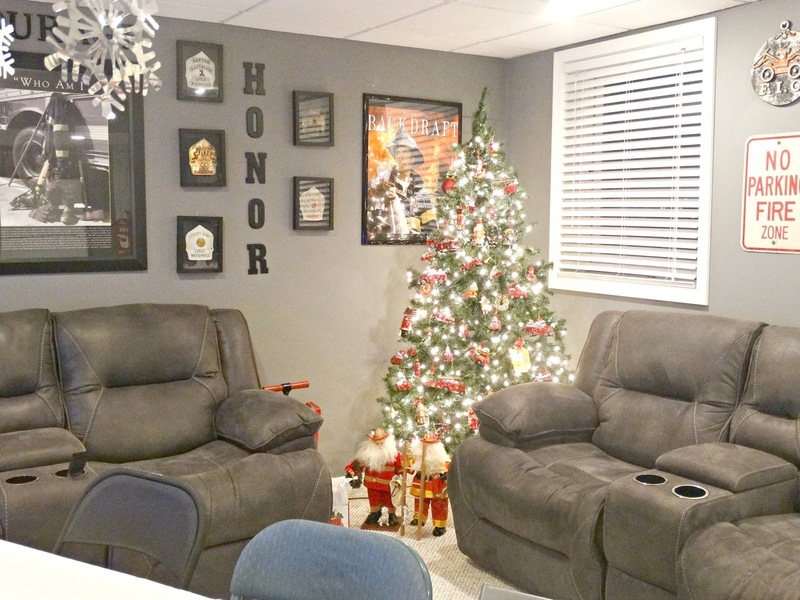 Terry's man cave looks so festive. What a fun surprise, Kris! Your hubby is so thoughtful! So great you and Diana finally got to meet up! The party is such a great tradition...looked like it was FUN! Such a treat for Diana to be with you. Terry is a sweet guy. Looks like you all had a blast. And your home looks amazing. 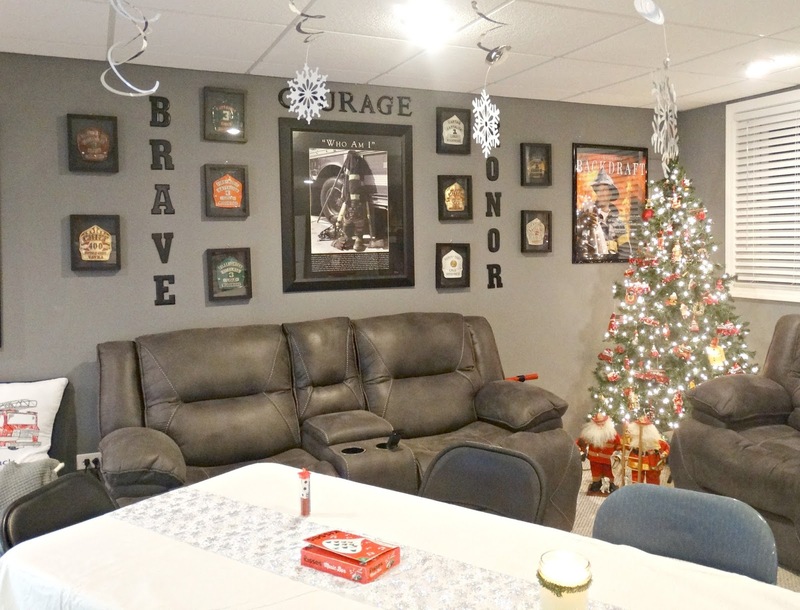 My husband would love to have his own cave area, but alas that's not going to happen (his own garage is about as far as it goes). And I'm so excited that you got to meet Diana in person!!! So awesome that Diana was a surprise at your party! Best hubby! I love your lace curtains! Your home is lovely and looks like everyone had great fun! Oh, that is on my bucket list...to meet Nana Diana in person! Your party and your home look great!!! Oh Kris, how wonderful for Terry to surprise you with having Diana there. It looks like you guys had a terrific time at the party. 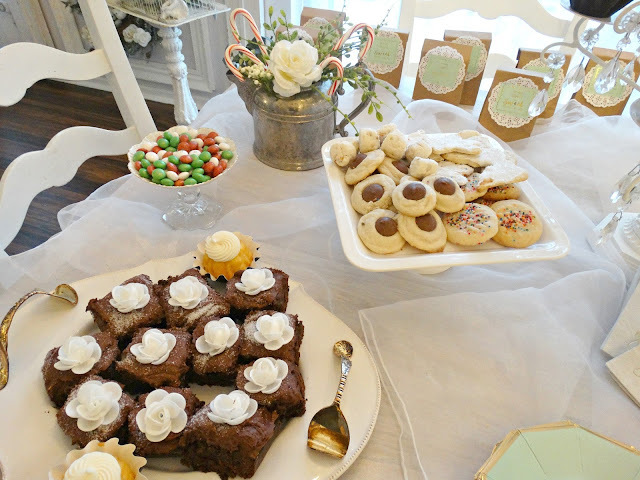 The food and dessert look amazing. 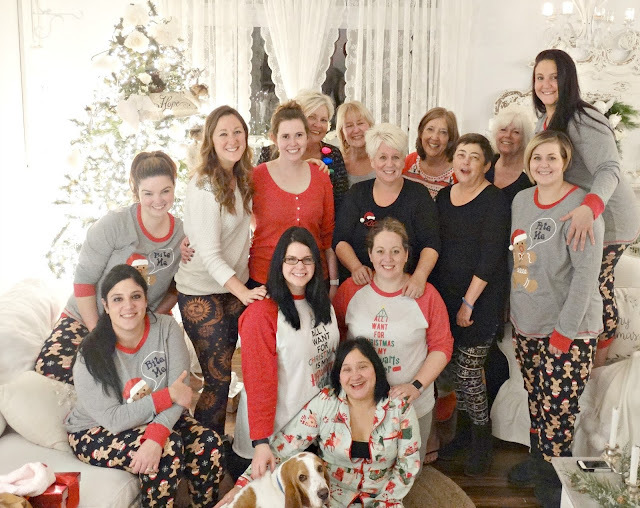 Love all the PJ's on the gals. I know this is the highlight of the Christmas season kick off. Thanks so much for sharing the pics with us, Looking forward to the post on your decor. That man of yours is remarkable! Thanks so much for stopping by today and leaving comments. So glad that you liked the post. Oh how fun and what a great surprise! Way to go, Terry! Love Diana and would like to meet her and you in person. Have a wonderful, blessed week! Helloooo Kris!*!*! Your HOME Looked GoRgeOus!!! What a fun surprise!!! HaPPy HoLiDays!*!*! This is the best. I am so glad that Terry did this for both of you. So precious. Looks like so much fun! Beautiful Party, Kris! What a treat for you having Diana come to your party. She really is such a lovely friend. Looks like everyone was enjoying themselves. Nothing like good friends, food, and laughter. Just love your blog-everything pretty and fun too. Diana is the best surprise, I couldn't wait to hear your reaction! 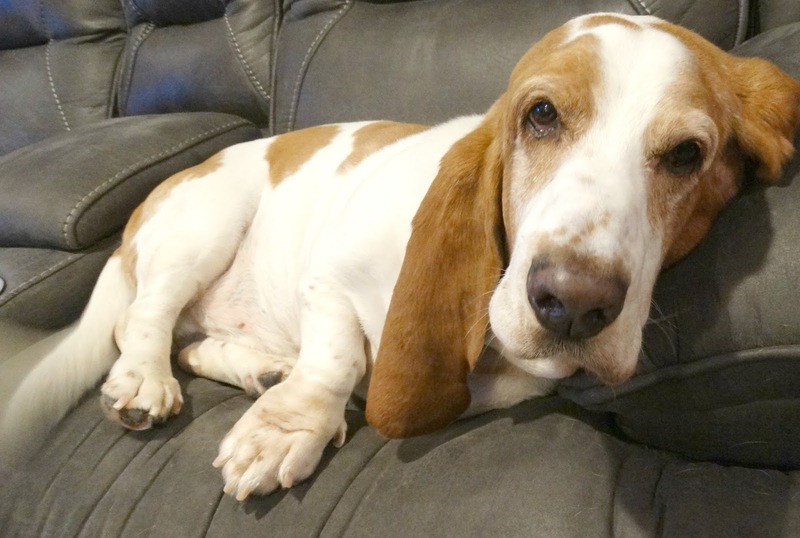 My friend had a basset named Cooper w/the same coloring. He was so wonderful and looked as neat as your boy. Happy Holidays to you. Thanks Ellie. He is a sweet boy and we love him. We are so fortunate his Cancer is in remission so that gives us more time with him. He is truly a big lug of love. Thank you for your visit here today and your sweet comment. Hi Kris, what a great party and to be surprised by Diana arriving had to be the highlight of the night. So glad you girls got to meet. Love seeing your pics all together and your beautiful home. What a pleasant and great surprise for you! Kris looks like a fun time was enjoyed by all, wow what a surprise from Diana. How much fun it must of been finally meeting after all these years. 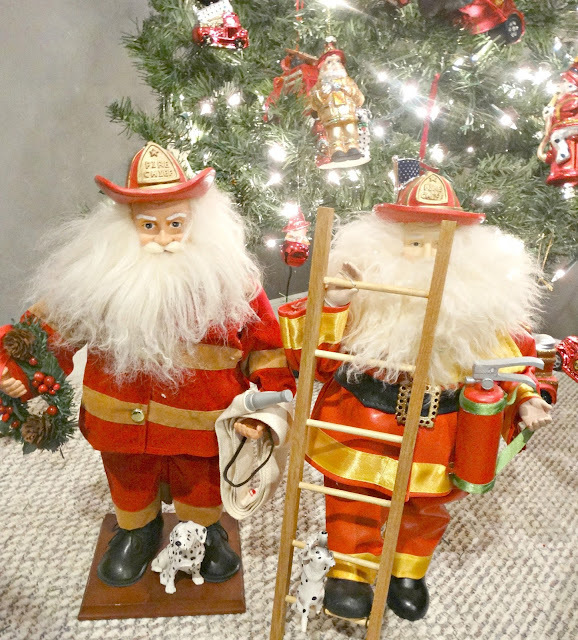 I love Terry's fire chief tree and all the love, time and attention to detail you pour into your party. Kris, what magic. Your white space is ethereal and I WANT TO BE THERE! Terry, what a man. What a MAN! CLAP CLAP CLAP, bravo to you all!!!!! How fun! You midwestern gals really know how to party! So far behind posting for Christmas, I have to get going. 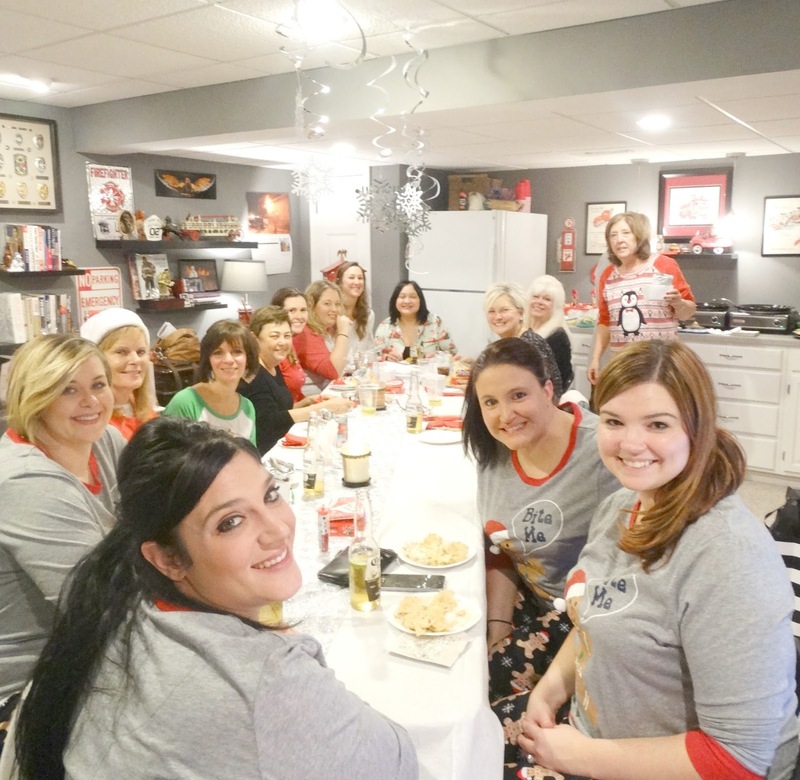 Your annual girl friend party always looks so fun! You really know how to throw a party too. You thought of every detail. Your house looked so pretty decorated for Christmas and it was fun to see Cooper join in this year! How neat was it for Diana to join you this year too?! I bet she would fit in anywhere since she is such a kind hearted person. I'm glad that you two got to meet in person and spend time together. Isn't it great that you're already making fun memories in your new house?! WOW! What a fun surprise! The party looks like a great time. I love how Cooper joined in. I am so happy Terry surprised you. ;-) That I am sure will be something you two will remember for a long time. HEY!!!!! I am sooooooo jealous!!!!!! I would have LOVED to have been there with y'all at the party!!!! You and Diana are so lucky that y'all finally got to meet each other!!! I bet y'all had so much fun! 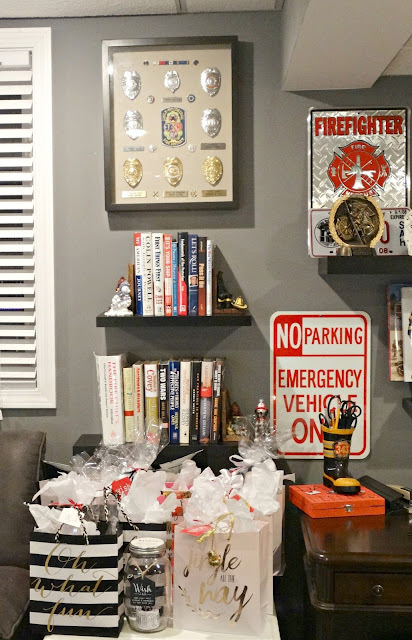 What a fun post and party and your hubby is so sweet to let y'all take over his man cave! LOVE it! You are the hostess with the mostest, Kris! Like you, I don't like surprises...but I have to admit this was a good one! Loved seeing your photos again this year and it looks like you all had such a wonderful time! Your home is just gorgeous Kris! Thanks Kimberly. I hate surprises but this one was a good one. Diana is so sweet and fun. She fit right in with my crazy friends. It was a special night. This is so so wonderful!. What a sweet and special gift to have Diana come for your party. That guy of yours is a keeper. You two are just glowing. All of your details are amazing. I'm sure everyone had a wonderful time. And I love that Cooper just invited himself. He knows a good thing when he sees or smells??? it! Smart dog :) Thank you for sharing your fun time and great pictures with us. Have a wonderful week. I read about this on Diana's blog, too and your hubby was so sweet to surprise you like that! What a fun party. Dang wish I didn't live so far away! How fun! I keep thinking I have got to do this! Ok, this is way too awesome! First off, you two look like sisters, and I bet I'm not the first person to tell you that. Second, how lucky are you to have a husband that a: had the wherewithal to pull this off and b: had the inclination to do so. Add in that he's a handy guy, and well, you hit the jackpot Kris! I would have loved to have been a fly on the wall at your party! What an awesome treat and wonderful surprise! I agree with Doreen you and Diana do look like sisters and beautiful ones at that! This was such a special event and I am just so happy for you all! You have a keeper, Kris. How sweet was that! Looks like a fun time was had by all, including Cooper. Judging by the photos, you are the hostess with the mostess! It seems like you had a fabulous party again, Kris. All the girls look so happy. You all must have had lots of fun and I'm sure Cooper enjoyed the attention he got from everyone. What a great and sweet surprise Terry organized for you. He's a very special guy. Kris, you are the best, most thoughtful hostess with the mostest ever! What a sweet surprise that Diana could give you that fun surprise!